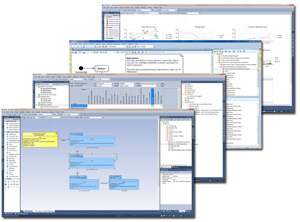 "Enterprise Architect is a comprehensive UML analysis and design tool for UML, SysML, BPMN and many other technologies. Covering software development from requirements gathering through to the analysis stages, design models, testing and maintenance. EA outfits your entire team, including analysts, testers, project managers, quality control staff and deployment team, for a fraction of the cost of some competing products. EA is a multi-user, Windows-based, graphical tool designed to help you build robust and maintainable software. It also features flexible and high quality documentation output. The user manual is available online. Take a look at our executive summary here. Your software projects are important to us. We have the tool to provide you with optimal support. We looked for a way to optimally support our customers in all steps of their software development projects. With Enterprise Architect, we are happy to present a tool supporting you throughout your development cycle. But Enterprise Architect (EA) is not just a development tool. Based on the UML 2.5 specification from the Object Management Group (OMG), EA is the most reliable, most function-rich, most flexible and most extensive software design tool on the market. And all this at an unbeatable price! Sign up to our Newsletter and get all Enterprise Architect News first hand - directly into your mailbox.